Sylvia Mathews Burwell, who was most recently the Secretary of the United States Department of Health and Human Services (HHS) under former President Barack Obama, has been named the 15th President of American University in Washington, DC. She succeeds Neil Kerwin as president and will assume her responsibilities on June 1, 2017. Burwell, the first woman to hold the highest leadership position at AU, emerged as the top candidate in a very competitive national search. Watch the video of the announcement of President Burwell's appointment. “Secretary Burwell’s success at HHS reflects three key abilities that will make her an excellent president for our university. She fosters research and scholarship, and turns them into action. She embraces and leverages the strengths of a large, diverse institution to advance its goals, and she is able to convey complex ideas to a wide range of audiences, from members of Congress to the public, in pushing for evidence-based actions and outcomes,” said Kiho Kim, professor of environmental science at AU and a member of the Presidential Search Committee. 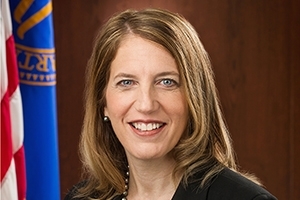 Burwell comes to AU after having served as the 22nd Secretary of HHS, a role she held from 2014 through the end of President Obama’s second term. Prior to that Cabinet appointment, Burwell was Director of the Office of Management and Budget (OMB), also a Cabinet position. An accomplished senior government official and global foundation executive, Burwell is a leader of immense character and vision, known for her rigor of thought and laser-like focus on mission. A Rhodes Scholar, she possesses an inherent intellectual curiosity that she has applied to push the boundaries of knowledge in order to address complex problems. “These traits, combined with her experience and commitment to education and research, make her well-suited to lead AU at this moment in our history, as we build on the momentum and progress achieved in recent years,” said Jack Cassell, Chairman of AU’s Board of Trustees. Burwell has managed large and complex organizations across the public and private sector. Her career reflects strategic thought leadership at the highest levels of U.S. government, and global executive leadership at two of the world’s largest and most well-known non-profit and corporate foundations. Prior to her roles in the Obama Administration, she was President of the Walmart Foundation, where she led efforts to fight hunger in America, empower women around the world and improve local communities. Previously, she served at the Bill & Melinda Gates Foundation for a decade as Chief Operating Officer and then as the founding President of the Gates Foundation’s Global Development Program, where she helped advance solutions to some of the world’s most pressing global public health issues. Burwell with Bill and Melinda Gates during a Gates Foundation visit to Africa. Photo courtesy of Sylvia Burwell. “Given the challenges facing higher education, our nation, and our world, I think there is no better time for American University to assert its considerable strengths, to lead and convene thought leaders, and take on the world’s thorniest problems. I welcome the opportunity to help AU expand its scholarly influence, enhance the student experience, and be a model for inclusion and innovation at a time when these ideals are vitally important,” Burwell said. During her recent government tenure, HHS advanced the most comprehensive reform of the nation’s health care system in a generation; confronted urgent public health issues, such as the opioid crisis; through the Centers for Disease Control, addressed the Zika and Ebola outbreaks; and at the National Institutes of Health, supported advancements at the forefront of biomedical research. At OMB, she helped lead the negotiations that won a landmark two-year budget agreement. Burwell also held leadership roles in the Clinton Administration, including as Deputy Chief of Staff to the President and Chief of Staff to the U.S. Secretary of Treasury. She has served on the boards of the Council on Foreign Relations, MetLife, and the University of Washington Medical center, among other organizations. Burwell earned an A.B. in Government from Harvard University, and earned a BA in Philosophy, Politics, and Economics from the University of Oxford. She is married and has two children. Burwell inherits a university on a remarkable ascent over the last decade. During Neil Kerwin’s tenure, AU has experienced the most intensive period of transformation in its history—both in prestige and in physical space. AU research, as classified by the Carnegie Classification of Institutions of Higher Education, improved to the level “Doctoral: Higher Research Activity,” placing it in the company of research from institutions such as Dartmouth College and William and Mary. This resulted from strategic decisions to expand the number of doctoral programs and increase externally funded research productivity. AU became more selective, dramatically reducing its admission rate to 26 percent, the lowest in school history. The university more than doubled the amount of need-based financial aid and has seen a 21 percent decrease in average student debt for graduates with loans. Initiatives to personalize and integrate student services across campus and to better cultivate diversity and inclusion aim to make AU feel like home for all students. The most visible indication of AU’s transformation over the past 10 years is the more than 1.5 million new and/or renovated square feet of teaching, learning and residence hall space on main campus and the Washington College of Law’s new Tenley Campus. “AU’s trajectory over the last decade enables us to leverage our strengths and think in bold, ambitious ways,” Burwell said.